Learn Pruning Techniques with our Virtual Pruning Guide. Root growth should be well on its way to anchoring the transplant and expanding the size necessary to nourish the growing branches. Cut off root suckers and sprouts in the crown. Remove a few of the lowest limbs but others are temporarily left to help the trunk develop more taper and strength. Now it is time to make a good tree even better. Lower limbs are pruned off to raise the bottom of the crown well out of the way of human heads. The lowest limbs are now permanent limbs. 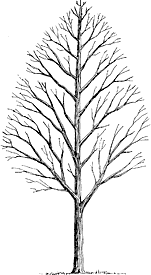 Please note: branches DO NOT move upward as a tree grows taller. The center of a branch at 5 feet will always be at 5 feet. Cut back a few of the higher up branches so they don’t protrude beyond the graceful outline of the crown. Inspect tree to see if you need to remove a branch here or there for even spacing. 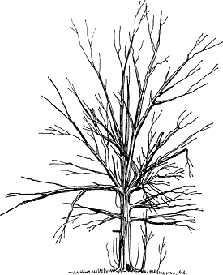 With proper pruning at the beginning of your trees life your tree will have a better chance of surviving extreme conditions such as wind storms, ice, and drought. That is because proper pruning gave strength to the branches. 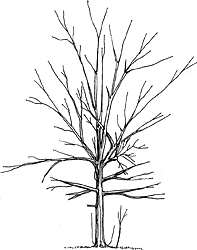 Early each spring, look for dead or damaged limbs. 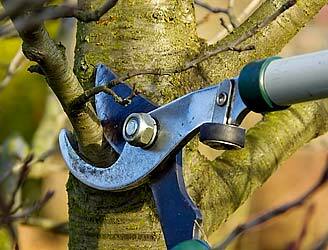 If you do have dead or damage limbs remove using proper pruning methods.